For those who don't know my story, late in 2010 I had to close my quilt shop and lost my beautiful log house. Another victim of the economy downturn and not enough future planning on my part. Yes, I do take part of the blame. The emotional pain was stifling.. I still think... "I want to go home". I lived 25 miles from Yosemite National Park. I miss the trees, the forest, the little fox that would come by each night to raid whatever cat food I had forgotten to pick up. I'm in Oregon living with my mom. That in itself isn't progress but it allowed a time of healing and reinvention. It took a while. I worked at a local quilt shop. Note to oneself. Do not go to work for another quilt shop owner. I taught some kids sewing classes. It helped pay a few bills and introduced me to a new experience. I went back to school... at 50 something. I discovered I'm a pretty decent student. Of course I drove my accounting teacher nuts. I started looking for something I could do with my creative spirit and earn money at the same time. 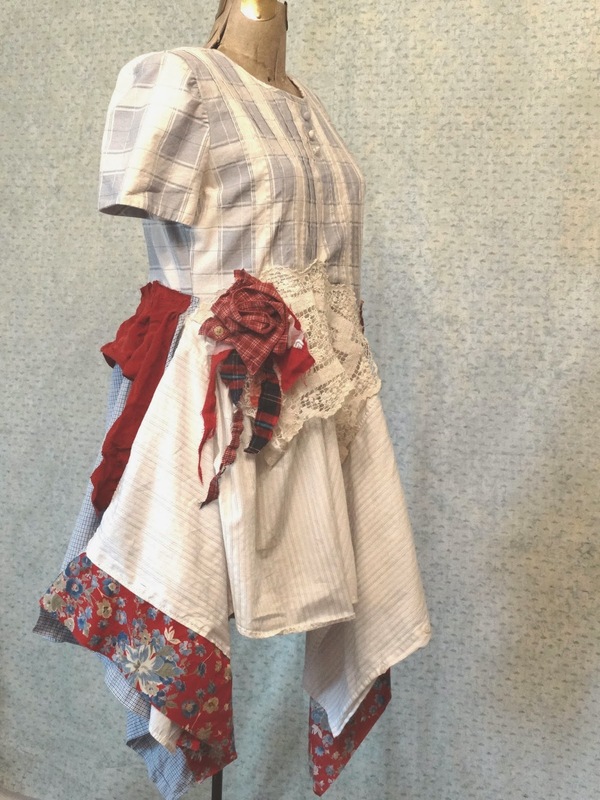 Enter Altered Couture Magazine and the local thrift stores in town. It's like every day is an "Aha Moment". I'm amazed I am still at it 7 months later. Not only that, but the February issue of Altered Couture has two of my creations. One, the managing editor liked so much she bought it and modeled it in the article. My sales are still slow. I'm learning to be patient. Steady and hand to the sewing machine. Don't stop now, I feel like I'm almost there. I'm still in school. I got my Accounting AA. I'm working toward an AA in Administrative Assistant. Just a back up. But in my heart I know because of my age, it most likely won't turn into a job. But it will make me a better businesswoman. And so the story goes on in a positive note. Finally, thankfully, and gratefully I think I'm going to make it. To God and the Universe. Keep on... and Thank you!